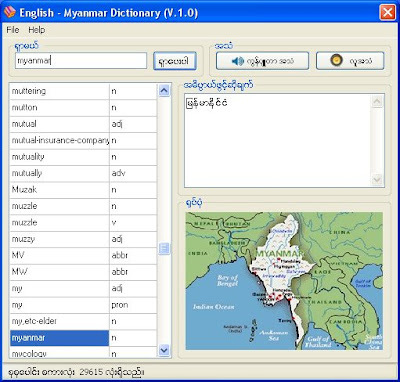 I've written this English-Myanmar Dictionary using ornagai db in last year. Microsoft Windows XP or Windows 2000 and above. - Tested on Windows XP Professional SP2 and Windows 2000 Professional SP4 on a tablet PC. No one is perfect, especially me. if you found some bugs, please let me know them with full details. In order to use Pictures, We need to add pictures to 'Picture' folder. from internet (avoid copyrighted pictures if possible). For Example: Word = "apple"
1. collect a picture from internet(an apple picture in this case). 2. give it the name "apple.jpg", because the Word is "apple" (you must save picture with ".jpg" extension). 3. resize or crop the picture around (height 175, width 250). When save choose low jpeg quality to reduce file size (if possible). (I resized pictures to W-200 and H-150, most of the pictures have less than 10KB). 4. Place the picture in "Picture" folder. Done! I made this program in my free time and it will be always free of charge. You can use in personal or commercial, you can redistribute it if you want. Hope it useful for someone!